Blue water, blue sky, bright sun and wind in my sails. Anchoring out, rocking to sleep with the gentle motion of the sea. Waking to a gray misty dawn, busy birds, seals swimming past. Is this a dream? Yes – a dream come true. 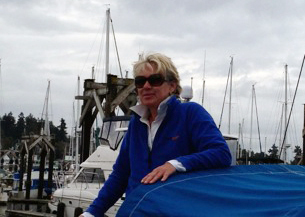 Several years ago, when I envisioned myself living on Orcas Island, sailing was an integral part of the picture. I longed for my own boat and the opportunity to cruise around and explore the intriguing coves, bays and islands of the San Juans and beyond. When you combine a rusty sailor, a boat needing work, and countless obstacles, you’ll understand how difficult it’s been for me to actually leave the dock and begin my journey. Then dear friends stepped aboard. Teri Williams and Jay Fowler were determined to take me sailing. They answered countless questions, made sure I had all my safety equipment on board, and helped me tend to practical issues. 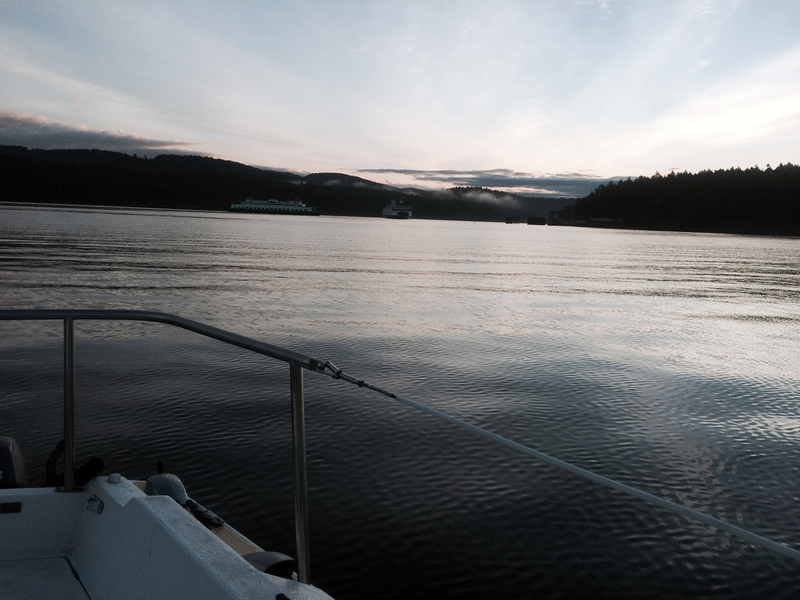 After the Labor Day crowds departed, we planned an overnight cruise to Blind Bay. The weather was perfect, and I sailed out of West Sound with the best crew ever. Winging it toward the channel, we sailed my 22’ Catalina to Bay Head, where we picked up Teri and Jay’s sailboat, the Blue Pearl. 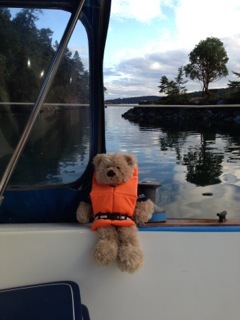 Then we motored over to Blind Bay, dropped anchor and rafted together for the night. Jay set two crab traps and we rowed over to explore Blind Island, enjoyed a wonderful dinner and watched the sun go down. 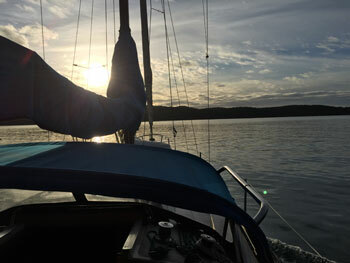 I peeked out of the companionway as dawn broke with a soft, filtered light illuminating Harney Channel and Blind Bay. Clouds streaked the early morning sky. The inky water was flat, almost glassy save for tiny ripples stirred up by the light breeze. Two ferries changed places at the Shaw landing, barely visible in the morning mist. This delightful view can only be seen from the water, and I soaked it all in. Filled with coffee, fruit and Teri’s Coffelt Farm bacon and egg sandwiches, and tending a bucket of crabs, we motored to Bay Head, where Jay docked the Blue Pearl. (I was getting plenty of important docking practice.) Skirting a ferry at the landing, we entered West Sound and had a glorious sail, tacking back and forth across the bay toward the marina, all the while adjusting sail trim and customizing the boat to suit my needs. This is not my first dream realized on Orcas Island, and it won’t be the last. What made this trip even more special is our deep friendship and Teri and Jay’s incredible generosity – they knew how much this maiden voyage would mean to me, understood how they could help in so many ways, and in their calm, collected and competent manner, helped me build knowledge, skills and confidence. With so many places to see, and so much to do, we’re planning our next trip. Let’s go! One of the great aspects of living in an outdoor destination like Orcas Island is that people of all ages love to visit. There are so many fun things to do here that even teens who are normally glued to the virtual world of their smartphones and other gadgets find enough real life adventure to stay entertained. The adventure begins by arriving on a seaplane painted like an orca whale. Day 1 starts with a boat ride to see whales. This J-pod male was cruising with his mates off Stuart Island. We saw the most whales we’d ever seen at one time – including three lively calves. On our cruise home we stopped to fish for the night’s dinner: pink salmon. Mid August is blackberry season. Each afternoon we picked fresh berries to enjoy on our ice cream. Yum! Throughout the week we caught delicious Dungeness Crab to enjoy fresh out of the pot, in crab cakes and crab salad wraps. Plus we feasted on the “lobster of the northwest”: Spot Shrimp, locally called Prawns. Our terrestrial activities included a hike up Turtleback Mountain. This scenic overlook on Turtleback Mountain made the perfect place for a picnic lunch. The Saturday Farmer’s Market was an ideal place to pick up island-made souvenirs for the folks back home. Meg piloted the dinghy to nearby Crane Island where we borrowed two kayaks. Our kayaking adventures included scenic Mountain Lake. It was as peaceful as I’d always imagined. After beaching the kayaks for snack time, we took a brisk dip in Mountain Lake. Brrr! Every night we were treated to a spectacular summer sunset. This one took first place. A last paddle on President Channel completes the perfect vacation. If this type of adventurous lifestyle appeals to you, I’d love to help you make it a reality. 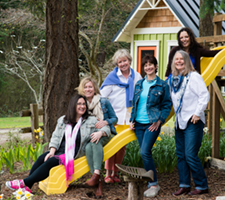 I specialize in helping people in all phases of life move to Orcas Island. Contact me and let’s begin! Heading to Friday Harbor on Christmas Day. Every other year Jay and I find it’s just the two of us on Christmas morning. We actually look forward to these holidays as much as the full-on grandma-and-pa celebrations with all the trimmings and train set running under the tree. This was our year and the Blue Pearl called for us to pull her away from the dock and breath the fresh salty air. Loaded down with a baked Coffelt ham, fixings for Debbie Woodruff’s garlic potatoes, my garden spaghetti squash, long johns and earmuffs, we pulled away from the dock at 3:00 on Christmas Day. Little did we know it would be a cruise to remember. We see only one other sailboat on the way, plus four powerboats. A half-hour under way it dawned on me – we are going to lose daylight! Probably a good time to ask Jay what is on his mind for the night. We usually tie up to a dock this time of the year as it’s warmer, you sleep better and wake up where you left her the night before. 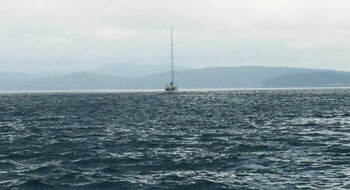 Windless, blue sky scattered with white clouds and sun on our face, we arrive at the Port of Friday Harbor at 4:08. Not bad, very calm, saw four powerboats and one sailor. On the foggy, cold morning after Christmas, the Blue Pearl heads north to Roche Harbor. No wind again (Jay says we really have a power boat). No sign of another adventurous sailor, we cross paths with Washington State Ferry headed to Vancouver and the Pintail barge. 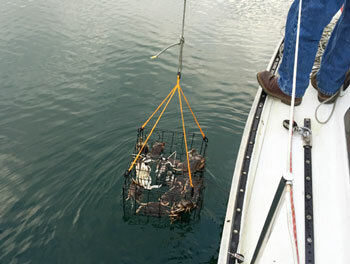 We bring up 16 crabs in our pot, three keepers. Arriving into Roche Harbor at 2:44, we dropped two crab pots and cruised the harbor (Laurie and Eric say it should only take 30 minutes and fresh chicken). Half an hour later we had 16 crabs in one pot, three keepers. Tie to dock at 4:11. Ready for warmth and a hot toddy. 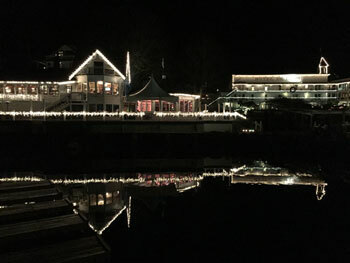 Festive lights decorate the dock in Roche Harbor. Crab on ice, we head to Roche restaurant, all lit with festive lights and music of the season. It really does feel like Christmas! Just then, off the north end of Jones we see what looks to be a porpoise, but turns out to be a mother and baby whale swimming. A few air blows of spray in the air and our hearts were racing. I run to get my iPhone and push the video button. No matter how many times or how many of these beautiful mammals you see it is always very exciting and memorable. So much so, you better memorize it in your soul because if you are like me, all you get on the video is sky and your feet with a lot of vocals that sound like “oh wow, oh wow, oh wow!” We must have been one of the first to see the new baby orca, Calf J50. We followed for a bit, but they were headed north and we would have had to buck the current, so turn around we did. We must have been among the first to see the new orca calf. It was a memorable Christmas indeed and a successful sailing on the Blue Pearl…. ahh, I mean motoring. No matter, the saying goes, there is nothing better than messing around on a boat, especially when you do it on Christmas, eating crab, dodging ferries and being one with the whales. Orcas Issues: Hey Girl, Who’s Yo Mama? Whenever I leave the office and Jay is not on call for OPALCO, we welcome the opportunity to go sailing. Every trip offers new discoveries, and gives us a chance to relax and appreciate our beautiful surroundings. In this boating log, I share my adventures with you. According to the Cruising Guide to the Puget Sound and San Juan Islands, Shallow Bay offers the best sunset views of any anchorage on Sucia Island and has the warmest water for swimming. Well, I cannot attest to the sunset due to thick heavy fog surrounding us the entire time we spent there. I can, however, state the bay supports swimming. 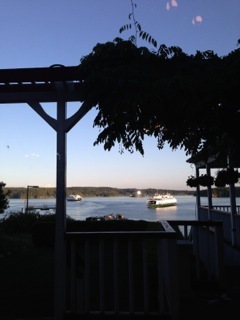 There was a wide Catamaran anchored shoreward of us where we watched and listened to four kids play and romp atop her wide deck all afternoon. When the fog thickened in the early evening we could only hear the kids, who were counting “one, two, three, go,” then splashes and gulps of air rang through the thick air, evidence of jumping into the water. This went on for some time. Very nostalgic, only to hear the sounds of this frolicking! During the day, Jay and I rowed ashore and did a two-hour hike over to the beach at Echo Bay and Fossil Bay. The woods were thick, but trails were more populated than Matia Island. The hike back to Shallow Bay from Fossil Bay looked more in keeping with the forest at Matia. The trail along the Echo Bay side was less dense, fewer trees and salal instead of large ferns. There are red and green markers at the entrance of Shallow Bay which can easily be seen from a distance. The depth changes quite fast when entering this area. Shallow Bay has seven mooring buoys, with some anchorage room as well, but the basin is smaller than it appears on the chart. Know your tides and allow for plenty of swing room. The guide states southeasterly winds can come across the marsh on the southeast end of the bay, but there’s no problem with swells from boat traffic out in Boundary Bay. We bounced around some during the night with what felt like swells, but never really heard the wind. Next time I believe we will choose to anchor so we are not hammering the buoy all night! All the shoreline around Shallow Bay is State Park land. The cluster of Sucia Islands was purchased in 1960 by the Puget Sound Interclub Association and then donated to the State for protection as a Washington State Marine Park. Fossil Bay gets its name from the fossils found in the surrounding bluffs and could easily be the most popular bay due to the number of individual buoys (15), can-line buoys (2), two floats (100’ in length) and plenty of room to anchor. Little Herndon Island used to serve as the guest book for Sucia, but the practice of writing your boat’s name on the cliffs is now prohibited. You can still see remnants of names, some believe due to the State coming out to sandblast the writing, which in some places just memorialized it. Head directly into Fossil Bay from the southwest, keeping in the middle and away from reefs off of the tip of Wiggins Head. Mud Bay behind Herndon Island dries at low tide.